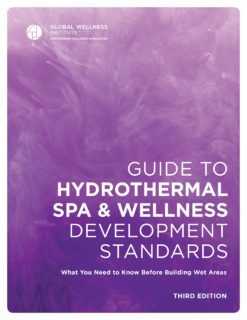 This initiative aims to increase transparency and awareness in the design and implementation of all elements of spas and wellness facilities involving thermal and wet treatments. It is our aim to improve the education of those working in these areas so they can best advise guests on the most beneficial way to use the features and to help therapists and specialists in other fields understand and effectively advise the use of these features to further benefit the health and wellness of their clients. The briefing paper is a snapshot of this industry sector including valuable information on latest trends, challenges and initiative accomplishments.